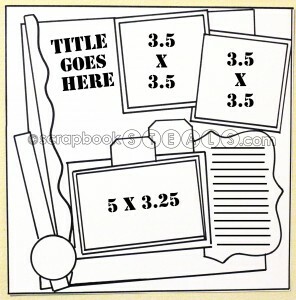 Here's another sketch from http://www.scrapbooksteals.com/! I am in love with the colors in this - it turns out I never use this color blue and it just "jumps" off the page. Mr Hueys mist is awesome... Love! Oh yeah, I use both. I love them! The smooch gives like a lighter 'hue' and a bit of glitter or shine. I do find the smooches get stuck too - sometimes I have put them under hot water to loosen up the opening of the spritzer. But I do love the hueys as you get a nice solid color and it dries pretty fast.